After receiving my Senior Diploma in Theatre Arts and Design at the Banff School of Fine Arts in 1978, I began my career in theatre arts stage management and production management until 2008, when I transitioned into Arts Administration. From 1981-86, I taught the Arts & Drama programs at St. Thomas Aquinas High School in North Vancouver, BC. During that time period, I also continued my studies and work in the Visual Arts, focusing on Byzantine Iconography over the next 35 years. 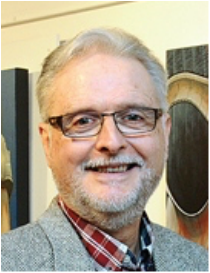 My extensive body of work includes icons and murals through British Columbia, Alberta, Manitoba, and USA, with major pieces in St. Mary’s Cathedral in Winnipeg, St. Joseph Basilica and All Saints Orthodox Cathedral in Edmonton, an icon as part of the Canadian Museum of Western Civilization collection, and my largest Icon for St. Andrew’s Cathedral in Victoria. In 2013, I began a journey of change and rediscovery, returning to my original painting with studies of Totems in acrylic, which became the ‘Journeying With The Totems’ series. It was important for me to think through what that natural progression could be, and why. It brought me to another form of iconographic images, which I’d had a life long love for, and which was also based on tradition and symbolic language. My admiration of First Nations art and carvings, notably the great icons of the West Coast Totems, combined with my other deep interest in the stages of aging wood, were my natural entry into this work. I’ve also had the great privilege of having Indigenous friends and acquaintances through my life, which informed my understanding and deep respect of the culture. With my own art experience being guided by tradition and reverence, I approach this recent series of totems paintings, not to create impressionistic images, but to approach them in deep respect and capture the essence of the great works carved by the Masters. It is of absolute importance to me to be faithful to what I see and to what viewers see when in the presence of the totems, and to always acknowledge their origins and carvers. The totems exude strength and nobility, both in their nature as wood and the carving that the masters have set into them. I am also deeply moved by the aging totems, as they remain vital as nature takes them gradually back to their origins in the earth. No two paintings are alike as I let each totem guide me in my journey of discovery. For clarity, I've kept separate tabs for the body of work in 'Iconography' and that of my other 'Visual Arts'. Under each tab, you will find a selection of Portfolios, News, Archival information and CV.